Equipping people to become Steward Leaders in our homes and congregations, as a response to a generous and loving God who showers us with abundant grace and forgiveness in Jesus. The Stewardship Team seeks to glorify God by assisting individuals and congregations to identify, develop, and use their resources to further the kingdom of God on earth. It achieves this by communicating how the mission dollars are spent through the annual narrative budget, letting congregations know of up coming stewardship events across the country, and providing educational opportunities for congregations to learn more what it means to be good stewards of what God has first given to us. 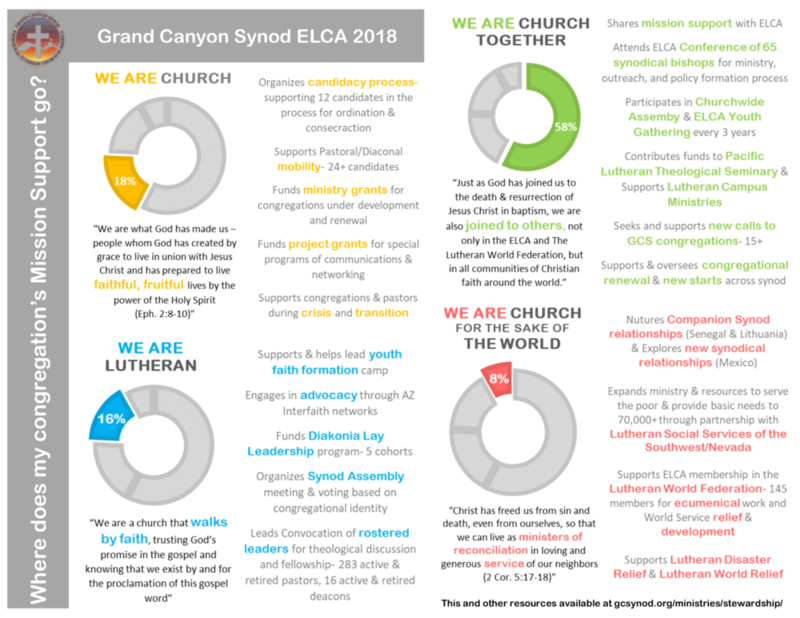 Our Narrative Spending Plan slideshow and PDF will help explain how the money sent to the Grand Canyon Synod is utilized for ministry. View our Narrative Spending Plan PowerPoint online, which has speaker's notes to help during a presentation. Download the GCS Narrative Spending Plan PDF handout to accompany the slide show. You may also find the ELCA's Narrative Spending plan to be a great resource, particularly the WDMOG Infographic.